Last night was a girl's-night-in sort of night. My friend Yvonne invited me over to cook some recipes we've been wanting to try. I brought one for bok choy in oyster sauce (coming soon.) She brought one for beef stroganoff (coming soon.) But when I arrived at her house, it smelled like bacon and I always like what that means. Yvonne was whipping up some roasted brussel sprouts, drizzled in a maple syrup/shallot sauce. Oh, and crumbled bacon on top. I'm hooked. We ate them like popcorn. 1. Place two strips of bacon on frying pan and cook over low heat. When crispy, set aside to cool. Then chop finely. 2. Boil pot of water. Drop in whole brussel sprouts for 2 minutes. Remove from pot and place into bowl of ice water. Cut brussel sprouts in half, and spread onto flat baking sheet. Drizzle olive oil and lightly salt. Place on high shelf in oven and broil for about 7- 10 minutes or until lightly blackened. 3. In a saute pan, saute shallot in olive oil until tender. Add maple syrup, brown sugar and apple cider vinegar and stir until slightly thickened. 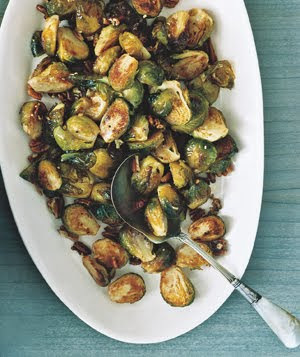 Toss in brussel sprouts and toss until coated. 4. Serve topped with bacon.